A COUNTDOWN clock visible on the scoreboard will aid players in moving back into their centre-bounce starting positions on time. AFL.com.au exclusively reported a fortnight ago competition officials were working towards having the countdown clock ready for round one to help reduce the number of warnings and free kicks. The clock will operate similarly to the set-shot equivalent and be active from Thursday night's season-opening Carlton-Richmond match at the MCG. 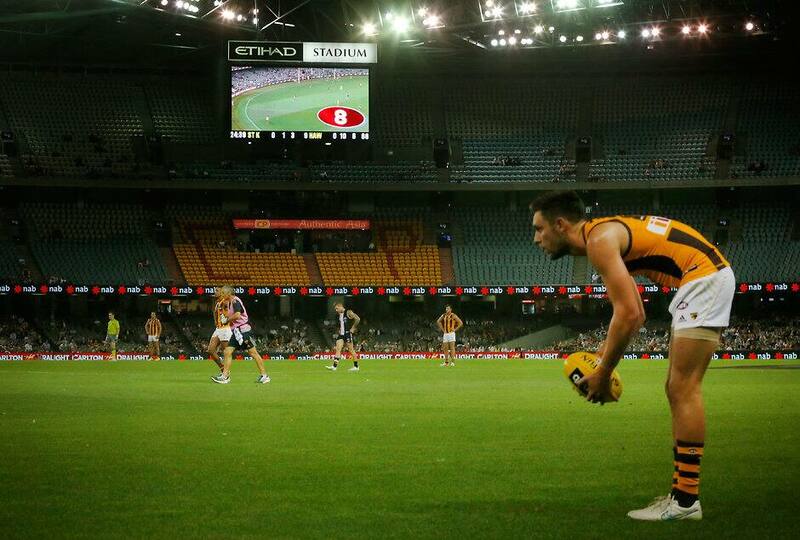 Players have 45 seconds to be inside their designated areas after goals under the new 6-6-6 rules at centre bounces. The countdown clock will appear on the scoreboard after 15 seconds, with 30 seconds remaining, and will begin to fade with about five seconds to go. Umpires paid numerous warnings and free kicks in the JLT Community Series for a 'delay of game' or 'line breach' when players failed to reach their designated areas within the limit after a goal. In those cases, teams are required to hold or reset in the 6-6-6 set-up until the umpire gives the ball to the ruckman, whereas players can move freely if a free kick is paid post a centre bounce. Starting positions are among nine new rules and interpretations in place for this season, with the AFL announcing them in October last year following a lengthy analysis of the game.